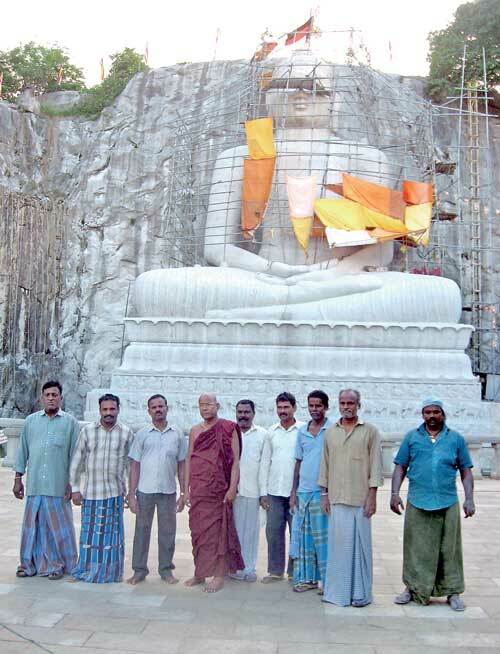 The Buddha’s preaching ‘Nahi Verena Verani’ (Hate cannot be conquered by hate) persuaded a Buddhist monk in the outskirts of Kurunegala to launch on a mammoth task of constructing the world’s largest sedent Buddha sculpted out of living rock. Starting with absolutely no funds, the Egodamulle Am aramoli Thera’s commitment and dedication along with the generous contributions from devotees with no bias of class, creed or race helped him achieve this task over a period of 12 years. Today a magnificent Samadhi Buddha statue can be viewed, worshipped and respected at Rambodagalla Vidayasagara Piriven Vihara where the monk is the chief prelate. It all started when three students attending the weekly ‘dahampasala’ at the temple were agitated over the destruction of the Bhamiyan statues in Afghanistan by the Taliban terrorists. “Swameenvanase, Eh gollobauddhaprathimavanaselavinashakaranavanamapi me game muslimpallivalayaginithiyanna one (Venerable Sir, if they can destroy our Buddha images, we must set fire to the Muslim mosques in our village), they suggested. Excited with the suggestion the children went home. For the monk it was going to be a big challenge. He had to find craftsmen who could undertake such a huge project. Unlike in the times of the Sinhalese kings, are there Sri Lankan craftsmen who are capable of handling such a gigantic job? he wondered. And he didn’t have funds either. About three months went by. One day the three boys turned up and handed over three tills to the monk. They were quite heavy. They had saved some money. They were all one rupee coins. “Ven. Sir, we have brought money to build the Buddha statue. Ven. Sir, you can now start building the statue. Please accept this money,” the boys said. The monk appreciated their gesture and gladly accepted the money. The three tills were broken. The money was counted. There were 1,358 one-rupee coins in all. The first donation had been received. Of course no one knew at that time that it would cost in the region of Rs. 100 million! Leaving aside finding the funds, the monk started studying the well-known Samadhi statues built during the time of the ancient kings. He paid special attention to the images in Anuradhapura, Vatada-ge and Gal Vihara in Polonnaruwa. His preference for the Rambodagalla statue was the one at Gal Vihara. The biggest hurdle the monk had to clear was the selection of a sculptor who had the knowledge and skills to deliver exactly what he had in mind. He had heard about a huge Hanuman statue built at a Hindu temple at Ramboda and decided to go and see it. As fate would have it, there he met the initiator of that project – prominent Colombo businessman Deivanayagam Eassuwaren, Chairman of Eswaran Brothers. “It was a Sunday morning. I saw a Buddhist monk standing in front of the temple admiring the statue. He sought my help to put him in touch with the sculptor who did it,” Eassuwaren recalled. When the monk told him that he intended erecting a 50-foot tall Buddha statue cut out of rock, Eassuwaren’s was a positive response. He wanted the monk to get ready to fly to Chennai in two weeks to meet the sculptor. There he arranged for the monk to meet Muthu Muthiah Sthapathi – a world renowned artiste who had been conferred the prestigious ‘Padma Sri’ award by the Indian Government in recognition of his skill. Although the master craftsman had not handled the construction of a Buddha image, Amaramoli Thera was amazed by the huge library the sculptor had and among the stock of books were ones on various Buddha statues built by ancient kings in various countries. After a few hours, they were able to finalise a picture for the Buddha statue they had in mind. The sculptor wanted to come to Sri Lanka and see for himself the quality of the rock stone before starting work. He came in early 2002 and found the quality to be excellent but looking at the site, he felt the height was not enough. He told the monk the statue should at least be about 65 feet. The monk agreed and work commenced immediately. Then came the question of funds. Eassuwaren had intervened and assured the monk that being a sacred venture done with the best of intentions towards creating the inner happiness and compassion in the minds of the devotees, the necessary help would automatically flow. So he encouraged the monk to pursue his dream irrespective of his vocation, religion and the cultural background and came to his aid whenever he could. “I basically fell for his marvellous dream, for his love, for his compassion, for his commitment,” Eassuwaren said. Master sculptor Muthiah Sthapathi came with eight workers and began work. The monk provided them with the necessary facilities with the funds that he collected from various sources. Keeping true to his word Eassuwaren stepped in whenever there was a need – be it funds, labour, salaries or misunderstandings. He coordinated the work at the site. “I can remember there were times when some of the workers wanted to leave and go while the work was in progress. I had to intervene and sort out their problems, get down new workers and make any adjustments in the sketches and so on,” he recollected. The master sculptor was very busy building temples all over the world. He was doing no less than 36 kovils in several countries including the USA, England and Thailand. “This was the first Buddha statue he was handling. Initially he wanted Rs. 5 million for his time, technical advice and construction work at site but ultimately he did it absolutely free of charge. He developed such a regard for the monk, respect for Lord Buddha and love for the people of Sri Lanka,” Eassuwaren said. “I myself feel so happy that I was able to help the monk in fulfilling a good deed. Getting involved in building the statue and to see people coming in thousands to worship brings so much satisfaction and blessings. I was certain that once we started the work, people would start visiting the place, they would make donations in whatever way they could and help would come in numerous ways. So the value of a project like this is immeasurable. You do it with love, not for personal glory, not expecting anything in return, purely on the love for Lord Buddha,” he added. Nandadasa Rajapaksa, Chairman of D Samson & Sons Ltd., a member of the DSI Samson Group of companies was told about the statue during a visit to Ridi Vihara which is in close proximity to the statue and went to see it. “I was amazed at what was being done. To sculpt such a tall statue from the rock looked an impossible task. Yet the team of Indian craftsmen was so skilful. At once I thought ‘here was a worthwhile project where I can be of assistance, both at a personal level and at the company level’,” he said. He spoke to Amaramoli Thera and found that what was needed were funds. He assured the monk to help raise funds because the moment he saw what was going on, he realised that it was not merely a Buddha statue but what could soon become a lasting symbol of communal harmony. “A top level South Indian Hindu craftsman was directing the construction. The other craftsmen were also Indians. They were being helped by the villagers who were carrying the building materials to the site and taking them up to the construction site. The people who were coming to see the statue, were donating money and help in other ways,” he recalled. Back in Colombo Rajapaksa earnestly spread the word around. He encouraged the company staff to be partners in the project. Several one-day shramadana campaigns were arranged where they could go and contribute their mite by working at the site. They spent their Poya holidays helping the working staff. “Once they saw the statue, naturally they told their friends and relations about it. The word spread by word of mouth. People began going to see the place. And naturally their pious thoughts made them contribute whatever they could,” he said. Meanwhile, he managed to convince his business friends to help and they readily responded. Rajapaksa thereafter sponsored a publicity campaign to create awareness throughout the country about the Rambodagalla Samadhi Buddha statue. This was done mainly through full page advertisements published in the newspapers on Poya Days and special occasions. Devote Buddhists as well as others who began admiring a marvel of the modern era slowly taking shape made donations and helped to increase the fund. When Rajapaksa heard that master craftsman Sthapathi had rejected any payment for his work, he thought of giving him a memento – something he would appreciate to remember the work he did in Sri Lanka. “I had got some ‘navaratne’ gem stones given to me by a good friend – a Muslim businessman in Ratnapura some years back. I got a ring made using the gems and gifted it to Muthiah Sthapathi saying that it was much more than a personal gift from me. I wanted him to treat it as a token of gratitude from the people of Sri Lanka representing all communities for the wonderful gift he had given them. The ring was handed over at a dinner hosted by Eassuwaren at his home in May 2008. On receiving it, he was so emotional and accepted it with tears in his eyes,” Rajapaksa reminisced. He was wearing the ring even on the day the statue was opened just before Vesak this year. “It occurred to me that he was showing me something that a Muslim businessman gave a Sinhala Buddhist who in turn gifted it to a Tamil Hindu artist. A totally unplanned sequence of events that revealed a defining and true symbol of communal harmony across communities, I thought,” said Rajapaksa. “My organisation and I have been privileged and blessed to have had such a close involvement and for the opportunity to be a part of this momentous and historical undertaking,” he added. Paying his respects at the sacred unveiling of the Samadhi Buddha statue at Rambadagalla, President Maithripala Sirisena described it as a golden day when a new chapter has been written in Sri Lankan Buddhist history. He paid a tribute to Egodamulla Amaramoli Thera for shouldering the Herculean task of constructing the world’s tallest rock carved sedent Buddha statue. Prime Minister Ranil Wickremesinghe hailed the project as one which brings back the splendour of the past that was enjoyed by the people. He thanked Sthapathi for his outstanding contribution to this enormous undertaking and paid his gratitude to Amaramoli Thera for shouldering a gigantic task of bringing back the glory of our ancient kings to modern day Sri Lanka. Former High Commissioner for India in Sri Lanka, Nirupama Rao said she was privileged to be present at the site of what is to be the world’s largest granite statue of the sedent Lord Buddha whose eternal message of peace, love and compassion for all living beings provides a powerful beacon in our daily lives. It was 12 years or more of hard labour and untold challenges in many aspects – funds, materials, transport, clearing the land and other untold logistical challenges and so on. It is indeed a great achievement where many rallied round to create a masterpiece and carve a piece of history of sculpture that will remain for many centuries to come as a symbol of unity and comradeship apart from being a sacred monument of worship in honour of Lord Buddha.